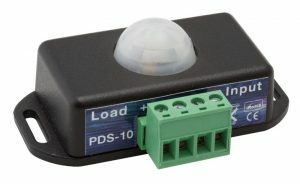 The PDS-10 is a motion activated switch for 12 and 24 Volt systems in which a Passive Infra-red Detector is used. On the LOAD output of the PDS-10 a light bulb, or other load, of 12 or 24 Volt can be connected. The maximum load is 10 Amps continuous. The PDS-10 is designed for indoor use only. This could be, for example, the cargo space of a truck, a bus or inside a boat. The PDS-10 has overcurrent, over/undervoltage protection and also has a time delay on the low voltage side. Motion activated switch by the use of a Passive infra-red Detector. Autodetect input voltage of 12 or 24 Vdc.